Memorandum submitted by Lyndon LaRouche to hearings in the Russian Parliament in 1995. On February 20, the lower house of the Russian Parliament, the State Duma, holds special hearings to discuss emergency measures to prevent the disintegration of Russia's economy. 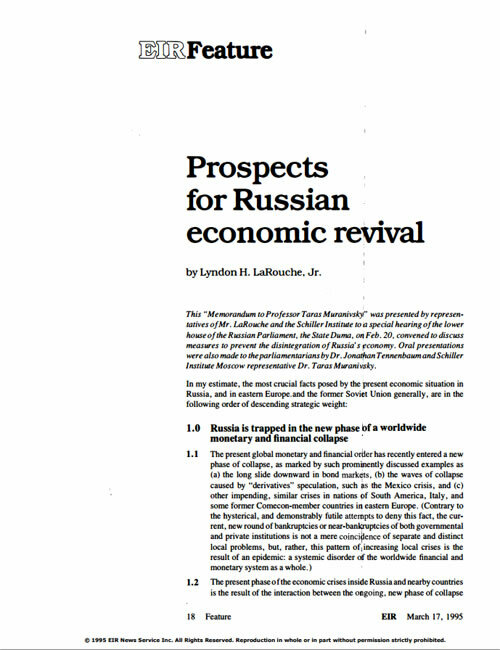 A memorandum submitted by LaRouche, titled "Prospects for Russian Economic Revival" [PDF] was presented to the hearing, in addition to oral presentations made by representatives of the Schiller Institute in Moscow. 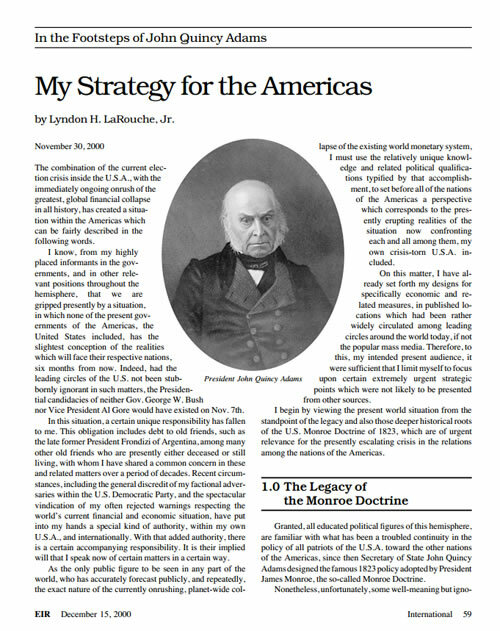 In the first point of LaRouche's memorandum, he states: "The present phase of the economic crises inside Russia and nearby countries is the result of the interaction between the ongoing, new phase of collapse in the world monetary and financial systems, and the relative exhaustion of Russia's ability to deliver a stream of loot to western financier interests. There exists no possible solution to this crisis, either for Russia or for the world, within the bounds of the previously accepted terms of dominant international economic and financial institutions. The present world system, as derived from the post-1971 form of 'floating exchange-rate' international monetary system, and present doctrines of IMF 'conditionalities,' is doomed to extinction during the near- to medium-term. The present system will either be brought to an end in an orderly way, through governments acting responsibly to put existing central banking and financial systems under state-controlled reorganization in bankruptcy, or through a chain-reaction form of rapid, "thermonuclear" implosion of that speculative financial bubble which the world's financial system has become. All workable alternatives to general collapse require governments to assume responsibility for the establishment of new monetary and financial institutions to replace the bankrupt institutions which continue to dominate the world up to this moment." 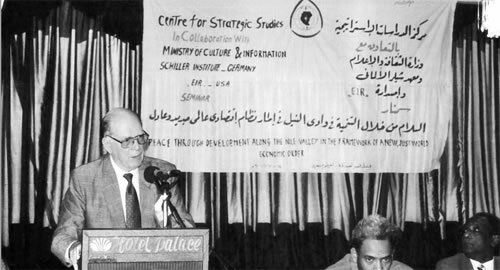 Lyndon LaRouche during his second trip to Moscow in June 1995, speaking at a seminar on physical economics sponsored by Moscow State University. 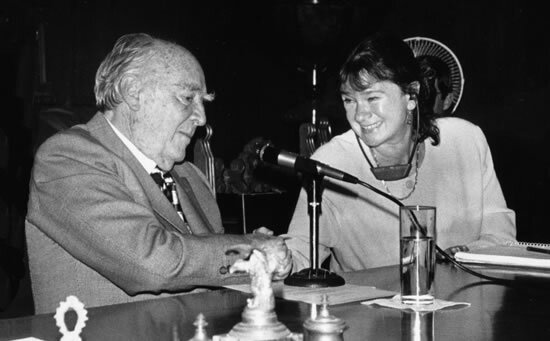 In June 1995, Lyndon LaRouche makes his second trip to Russia, joined by his wife Helga Zepp-LaRouche, where he testifies before the Russian State Duma on the topic "The World Financial System and Problems of Economic Growth." LaRouche also delivers addresses at the Methodological University of Russia, the Institute of Economics of the Russian Academy of Sciences, and at Moscow State University [PDF], where he stated that the world is headed toward what Rosa Luxemburg identified as "a breakdown crisis" and the only solution is to declare the IMF bankrupt and initiate an international credit system to build the Eurasian Landbridge project: "Some believe the present IMF system must be reformed but essentially only administrative reforms. Others of us take the view, as I do, that the international monetary and financial system of the world today, is totally bankrupt, and that only the elimination of that system by bankruptcy, and the establishment of a new system, is possible." 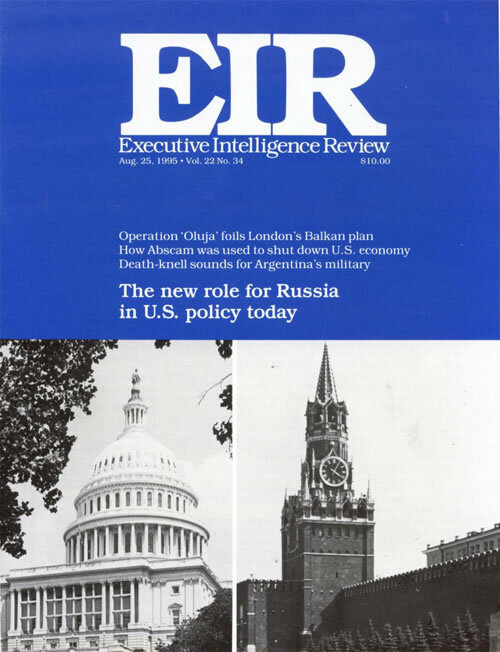 Lyndon LaRouche publishes strategic report titled 'The New Role for Russia in US Policy Today' as a preface to a policy paper by Russian Academician Dmitri Lvov. Executive Intelligence Review publishes a report by Academician Dmitri Lvov, the vice-director of the Central Economic-Mathematical Institute (CEMI) in Russia, called "Toward a Scientific Grounding for Economic Reforms in Russia" [PDF]. 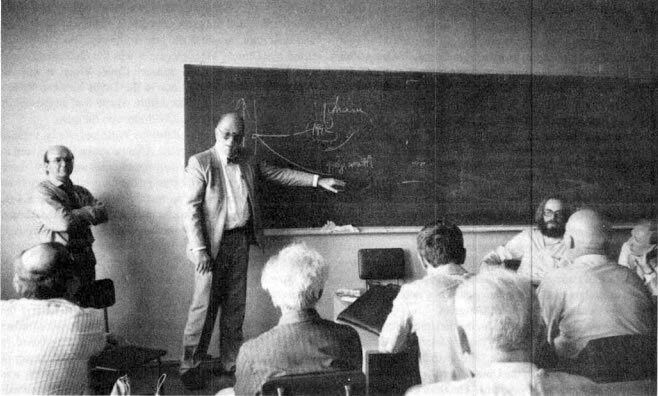 Academician Lvov had hosted seminars at CEMI in the 1980s to study LaRouche's economic model at the time Moscow was examining the strategic and economic implications of the Strategic Defense Initiative. Lvov's paper is prefaced by a short introduction by LaRouche, titled "The New Role for Russia in U.S. Policy Today" [PDF], in which he states: "As the present, IMF-centered, global monetary and financial system disintegrates in a holocaust of reversed financial leverage , Russia's present, most crucial predicament will be shared by every nation of this planet. The challenge will be, to prevent the collapse of the Earth's physical economy, by launching immediately a new world monetary and state-credit system, on the basis of "American System" principles contrary to every direction of change in economic policy, under the IMF and World Bank system, during the recent thirty years . In short, the Adam Smith system is shortly to be carried away by the same Styx of dead history into which the Soviet system had been thrown an historical instant earlier." LaRouche meets with Russian intelligentsia at the Institute for Socio-Political Research of the Russian Academy of Sciences. In April, Lyndon LaRouche makes his third trip to Russia to conduct meetings with top-level academics and policy makers from the Russian intelligentsia. LaRouche participates in a round table discussion jointly sponsored by the Institute for Socio-Political Research of the Russian Academy of Sciences and the Free Economic Society of Russia, established 1765. The event is chaired by Leonid Abalkin, head of the Institute of Economics of the Russian Academy of Sciences and economic advisor to the President, who invited LaRouche to speak on the subject "Russia, the U.S.A., and the Global Financial Crisis" [PDF]. LaRouche emphasizes that a partnership between the United States, Russia, and China of the sort that Franklin Roosevelt organized to defeat fascism in the 1940s, would be the combination of world powers necessary to reorganize the international financial system: "We are in the middle of the worst international monetary and financial crisis of the century... The combination of the United States and Russia, now, as in 1945, with the cooperation of China can change the course of world history, and get out of this economic mess... Only a majority combination among great powers can break the power of these international authorities. Therefore, not in order to create another global hegemonic system, but to create a world which is safe for sovereign nation-states. We're in a great struggle. We're in a great, strategic world-historical struggle. And therefore, as in war, the unity of great powers can be decisive in whether you win the war or lose it, as Roosevelt understood before he died." 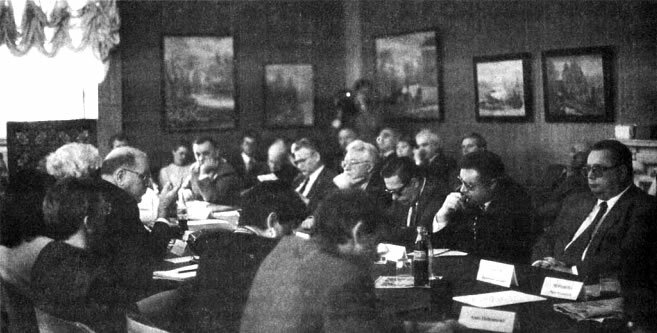 LaRouche participates in a round-table seminar of Russian economists and political figures at the Free Economic Society in Moscow April 24, 1996. Participating in the dialogue with Mr. LaRouche were Valentin Pavlov, former Prime Minister of the Soviet Union and former finance minister of the U.S.S.R., and Vyacheslav Senchagov director of the Center for Banking and Financial Research at the Russian Academy of Sciences Institute of Economics. At the conclusion of the event, Academician Abalkin stated: "Today we are facing the necessity of developing a new paradigm in the social sciences... I see all the work of Professor LaRouche as a step on the path to this paradigm." 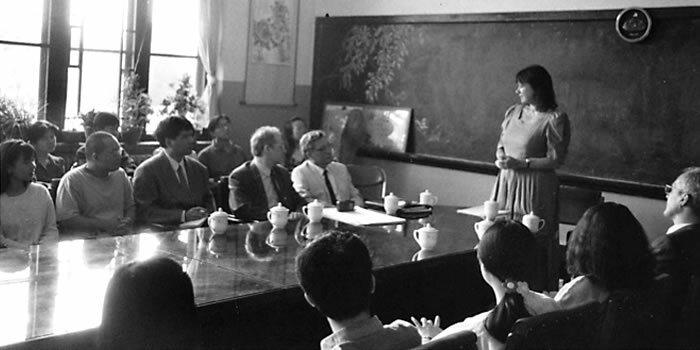 Immediately after Lyndon LaRouche's visit to Russia, Helga Zepp-LaRouche travels to China to attend a conference in Beijing to attend the "International Symposium on Economic Development of the New Euro-Asia Continental Bridge," sponsored by the Ministry of Foreign Trade and Economic Cooperation of the People's Republic of China. Helga LaRouche delivered a speech on May 8, called "Building the Silk Road Land-Bridge: The Basis for the Mutual Security Interests of Asia and Europe" [PDF], in which she states: "The governments of Eurasia should agree on an integrated infrastructure program, which connects the industrial centers of Europe and Asia with the population centers in South and Southeast Asia, through 'development corridors.' The development of those main axes of traffic, through Great Projects for infrastructure in transport, energy, water, and communications, is the precondition, to lay the groundwork for the industrial development of the Eurasian land-mass, and can thus become the motor for overcoming the world economic crisis." 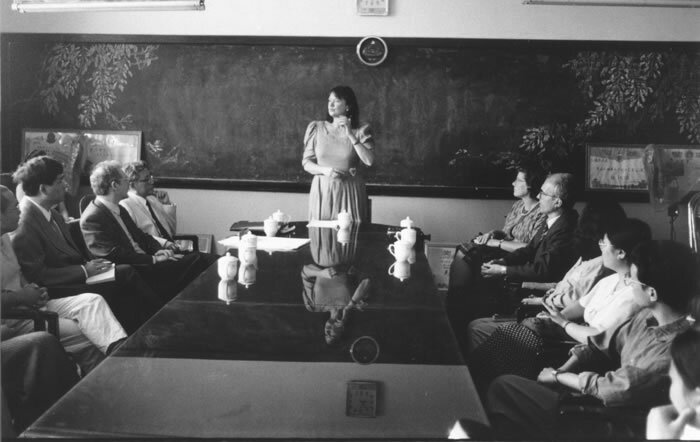 Helga LaRouche calls for the establishment of a Eurasian Development Bank in the image of Lyndon LaRouche's original International Development Bank (IDB) proposal, to facilitate cooperation among the sovereign states of Eurasia for development: "The right to generate credit must be brought back under the control of sovereign governments. Through appropriate legislation, national banks must be able to generate credit lines for these projects. As these credits are related to future production, wealth is being created, and they are not inflationary... As the realization of infrastructure projects of this magnitude, will require all available industrial capacities of the participating nations, and, as new capacities have to be created, the different countries should work in a division of labor, and thereby balance existing three-way trade flows through so-called clearing-houses. A newly founded Eurasian Development Bank could take over this task." Finally, Mrs. LaRouche calls for the convening of "an emergency monetary policy meeting of the principal nation-state powers, for the purpose of establishing a new international monetary system, based on stabilized parities of currencies, to the purpose of fostering a global revival and expansion of agricultural and industrial production, based upon capital intensive, energy-intensive modes of investment, in scientific and technological progress." On February 5, Lyndon and Helga LaRouche host a seminar of diplomats in Washington D.C. [VIDEO] to announce the official release of a book-length special report by Executive Intelligence Review called "The Eurasian Landbridge: The New Silk Road Locomotive For Worldwide Economic Development". 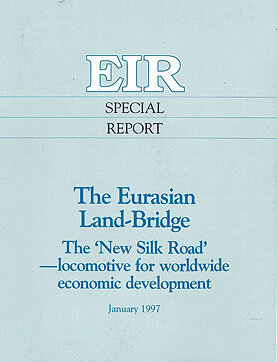 In the introduction of this 300-page detailed 'blueprint' compendium of development projects across the Eurasian landmass, LaRouche is quoted: "Call together an immediate emergency conference of crucial powers, an international monetary conference setting up a new monetary system to replace the bankrupt one." "The realization of the 'New Silk Road' and the 'Productive Triangle,' a real reconstruction of Russia and Eastern Europe, the development of the entire Eurasian landmass with the most modern infrastructure, would be the central economic issue at such a monetary conference of world powers. The connection of the new financial and monetary system, with concrete development projects which demonstrably would set a new, worldwide economic miracle into motion, would guarantee the success of the new system, overcoming the current crisis, and ensuring the fundamental economic security of the world far into the future." 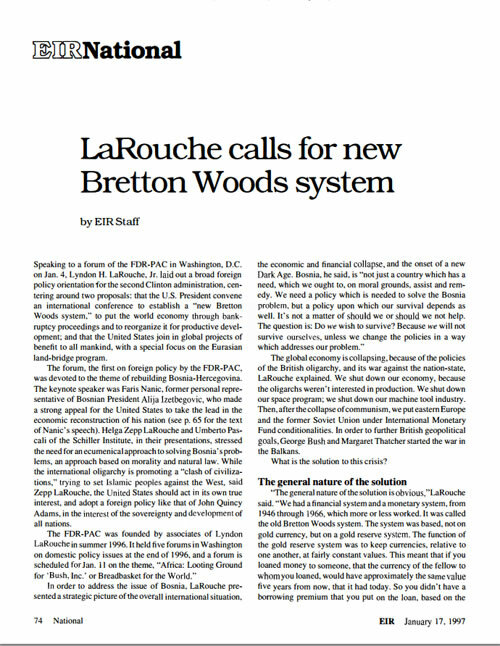 Lyndon LaRouche first issues his call for a New Bretton Woods at a conference in Washington DC in January 1997. On January 4, LaRouche delivers an address in Washington D.C., in which he first issues his call for a 'New Bretton Woods' to reorganize the world financial system, calling on President Bill Clinton to convene an international conference to launch a general monetary reform for the planet on the basis of mutual development: "The President must say, 'We are going to proceed to put what we know to be bankrupt financial and monetary institutions, into bankruptcy, that is, into receivership, for financial reorganization under the supervision of government. The United States must act, together with other powers, to put the world into bankruptcy reorganization. Every financial system, every banking system in the world, is presently bankrupt! Therefore, the United States must take international leadership in proposing a new Bretton Woods. We have to create new banking systems, which is very simple to do, on the basis of the Hamilton model - national banking... We have the basis for coming to an international policy agreement on strategy, among such powers, on an ecumenical basis, to say, 'We're going to do this. We're going to take this system out of its misery, establish a new system, a new Bretton Woods. We're going to take the Eurasian Landbridge concept and what it represents as a policy, as a global policy, and we're going to rebuild this planet.'" LaRouche elaborates on his call to President Clinton to convene an international summit "to create a new monetary system" at a conference of the Schiller Institute in February, at which a resolution titled "Urgent Appeal to President Clinton to Convoke a New Bretton Woods Conference" [PDF] is endorsed by the participants. The appeal declares: "We appeal to you, President Clinton, to use the Powers of the Presidency of the United States, to convoke, on an emergency basis, a new international Bretton Woods conference, to replace the present bankrupt monetary system with a new one. A global debt reorganization, the establishment of fixed-parity exchange rates and a new set of trade and tariff agreements are the absolute precondition for stability in world economic and financial relations, which are required for a return to economic growth." The general nature of the solution is obvious. We had a financial system and a monetary system, from 1946 through 1966. which more or less worked. It was called the old Bretton Woods system. The system was based, not on gold currency, but on a gold reserve system. The function of the gold reserve system was to keep currencies, relative to one another, at fairly constant values. This meant that if you loaned money to someone, that the currency of the fellow to whom you loaned, would have approximately the same value five years from now, that it had today. So you didn't have a borrowing premium that you put on the loan, based on the expectation of the fluctuation of the currency. The President must say, 'We are going to proceed to put what we know to be bankrupt financial and monetary institutions, into bankruptcy, that is, into receivership, for financial reorganization under the supervision of government,' the same thing you do with a local bank if it goes bankrupt. The relevant state or federal institution must come in and put that bank into receivership, take it over, and process it, try to protect some of the depositors, and things of that sort, to prevent social chaos, to prevent that thing from becoming a spreading disease within the society, and to try to see what we can salvage out of it, in an orderly way, as opposed to a chaotic way. Therefore, the United States must take leadership, international leadership, in proposing a new Bretton Woods, which would be a good term for it, which is what I've proposed - that we're going to go back to the principles of the Bretton Woods system in its best years, and the United States, as the principal prospective partner in such agreement, will try to get every nation that's willing to go along with this idea, to assemble and do it. And, those that don't wish to go along with it, that's just tough, we're going to go ahead with it anyway. Our concern is not who's got a favorable or unfavorable balance of trade; our concern is to make sure that all the members of a community of nation-states become prosperous. And, therefore, our concern is that they become prosperous and secure, just as their concern is that we should remain prosperous and secure. And, therefore, we can make trade agreements and tariff agreements on that basis. The world economy, with the exception of China, is faced with an accelerating collapse of industrial capacity and the skyrocketing of unemployment, which has led to a political mass-strike process, shaking the foundations of many governments and social institutions around the world. The unavoidable bursting of the international derivatives bubble, or any relevant political event, could trigger a chain-reaction of stock market crashes and banking crises in many countries, leading toward the vaporization of the international financial system within a matter of days. The political, social, and military consequences of such a systemic crash would be incalculable. Meanwhile, the tragedy of the so-called IMF reform policies in the former Soviet Union is now playing out, in the form of a monstrous collapse of production, a demographic disaster, and an unprecedented criminalization of society, which has resulted in an even worse and more rapid catastrophe than has already occurred in Ibero-America and Africa. If the present course of these international policies is not changed, entire nations will vanish from the map of the earth, as is already demonstrated in Africa. And. as the conditions in Bulgaria and Albania illustrate, even Europe can plunge into a new dark age in a very short time. Germany, for example, has reached de facto the same level of unemployment as when Hitler came to power. We say, that not for "one people," but for the peoples of the world, it has become necessary not to dissolve the political, but the financial bands with the presently hegemonic financial institutions. Therefore, we appeal to you, President Clinton, to use the Powers of the Presidency of the United States, to convoke, on an emergency basis, a new international Bretton Woods conference, to replace the present bankrupt monetary system with a new one. A global debt reorganization, the establishment of fixed-parity exchange rates and a new set of trade and tariff agreements are the absolute precondition for stability in world economic and financial relations, which are required for a return to economic growth. It is also required that sovereign governments have exclusive responsibility for the emission of currency and the creation of credit and that, in the tradition of President Franklin D. Roosevelt's bold anti-depression programs, they make available cheap and long-term credit lines for large-scale investments in infrastructure, industry, and agriculture. The outline of a new world economic system is already taking shape. Led by the initiative of the Chinese government, several countries of Asia are currently engaged in the construction of the "New Eurasian Land-Bridge." By integrating all of the Eurasian continent economically, a similar "land-bridge" development is planned which will soon also connect the United States, via the Bering Strait, and Africa, via the Near East, bringing economic development and prosperity to all previously landlocked areas of the world. As a cornerstone of this global reconstruction program, the economist Lyndon LaRouche has emphasized what he terms the "Machine-Tool Principle." This principle is the recognition that the economy must be based on the fact, that it is solely the creative reason of the individual which is the source of wealth in society. It is the continued ability of creative reason to formulate adequate hypotheses about the laws of nature, which leads to scientific and technological progress. These discoveries are applied in the form of new, improved machine tools and in upgrading the skills of the labor force, resulting in increasing productivity of the productive process. The global economic reconstruction must therefore put absolute priority on Classical, unversal education and the strengthening of the creative powers of the individual. way that economic development can bring peace and stability to all comers of the world. Such a policy is therefore in the strategic security interest of the United States. It is also in the tradition of the Founding Fathers as a policy for a community of principle among nations. We appeal to you with the utmost urgency to take the necessary steps, so that your Presidency does not mark the beginning of a new dark age, but that of a new golden era of mankind. President Clinton calls for the convening of an international summit to create a 'new financial architecture' at a speech in New York City on September 14, 1998. On September 14, 1998, immediately after returning from a state visit to Russia, President Clinton delivers a major address to the Council on Foreign Relations in New York City in which he calls for "a new financial architecture for the 21st century." With the crash of the Russian bond market threatening to set off a chain reaction collapse of the global financial system, Clinton announces that he is convening an urgent conference of the finance ministers of the leading nations from both the developed and developing world (the G7 and the G22) to "douse the flames of the international financial crisis" and resolve "the biggest financial challenge facing the world in a half-century" - i.e. since the original Bretton Woods. 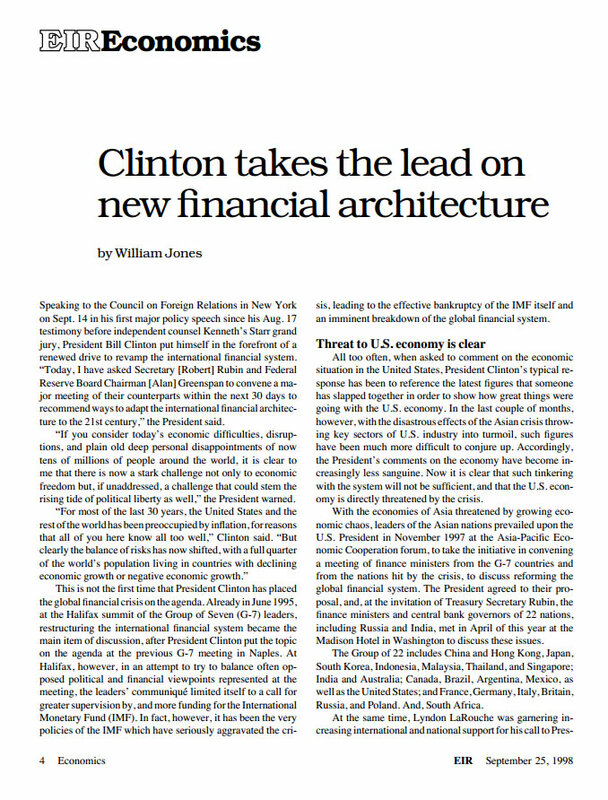 Clinton states: "In the face of this new challenge, America can and must continue to act and to lead to take the urgent steps needed today to calm the financial crisis, restart the engine of growth in Asia, and minimize the impact of financial turmoil on other nations, and to make certain that for tomorrow the institutions and rules of international finance and international trade are prepared to support steady and sustainable growth over the long term." At the conclusion of his address, Clinton invokes Franklin Roosevelt, saying: "At this moment, the United States is called upon once again to lead - to organize the forces of a committed world... The World War II generation did it for us 50 years ago. Now, it is time for us to rise to our responsibility, as America has called upon to do often so many times in the past. We can, if we do that, redeem the promise of the global economy and strengthen our nation for a new century." For most of the last 30 years, the United States and the rest of the world has been preoccupied by inflation, for reasons that all of you here know all too well - and it was a good thing to be preoccupied with. Today the low and stable inflation we enjoy has been critical to our economic health, and low inflation has also contributed to that of many other nations as well. But clearly the balance of risks has now shifted, with a full quarter of the world's population living in countries with declining economic growth or negative economic growth. Fast-moving currents have brought or aggravated problems in Russia and Asia. They threaten emerging economies from Latin America to South Africa. With a quarter of the world's population in declining growth, we must recognize [that] we cannot forever be an oasis of prosperity. Growth at home depends upon growth abroad. A full 30 percent of our growth, just since I became President, has been due to our expanding positive involvement in the global economy. Amid such political uncertainty and economic difficulty, some now talk of abandoning the path of reform and returning to policies of the past, even policies that have already failed. At worst, adversity in Russia could affect not only the Russian economy and prospects for our economic cooperation - at worst, it could have an impact on our cooperation with Russia on nuclear disarmament, on fighting terrorism and the spread of weapons of mass destruction, on standing together for peace, from the Balkans to the Middle East. Since all economies are increasingly interdependent, fear and uncertainty about the economy of one country can prompt investors to pull money out of other countries thousands of miles away. What has been done is clearly not enough to reverse the decline in particular countries, to douse the flames of the international financial crisis, to support steady and sustainable growth in the future. In the face of this new challenge, America can and must continue to act and to lead to take the urgent steps needed today to calm the financial crisis, restart the engine of growth in Asia, and minimize the impact of financial turmoil on other nations, and to make certain that for tomorrow the institutions and rules of international finance and international trade are prepared to support steady and sustainable growth over the long term. The second step we should take is to intensify our efforts to speed economic recovery in Asia. When countries like South Korea and Thailand have taken strong and responsible steps, the freefall has ended, progress is being made. But the human cost of Asia's collapse is only now being fully felt. Recent press reports have described an entire generation working its way into the middle class over 25 years, then being plummeted into poverty within a matter of months. The stories are heartbreaking - doctors and nurses forced to live in the lobby of a closed hospital; middle class families who own their own homes, sent their children to college, traveled abroad, now living by selling their possessions. At this moment, therefore, the United States is called upon once again to lead - to organize the forces of a committed world; to channel the unruly energies of the global economy into positive avenues; to advance our interests, reinforce our values, enhance our security. 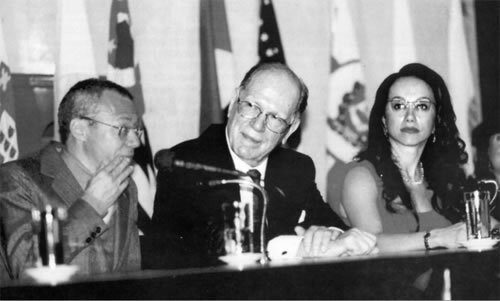 López Portillo: "World Must Listen To Wise Words of Lyndon LaRouche"
Helga Zepp-LaRouche and former President López Portillo at a press conference in Mexico in 1998. At a press conference in Mexico City, former President López Portillo joins Helga Zepp-LaRouche to discuss the urgency of establishing a New World Economic Order, asserting, "It is now necessary for the world to listen to the wise words of Lyndon LaRouche." In an accompanying editorial published in the leading Mexican newspaper El Universal, Portillo states: "The new economic order must be oriented to the increase of production, and not to the control of demand, the latter fundamentally directed to favoring capital (frequently, that of speculative capital) through outright depressive measures which reward profits, even if this postpones the satisfaction of real human, social needs." 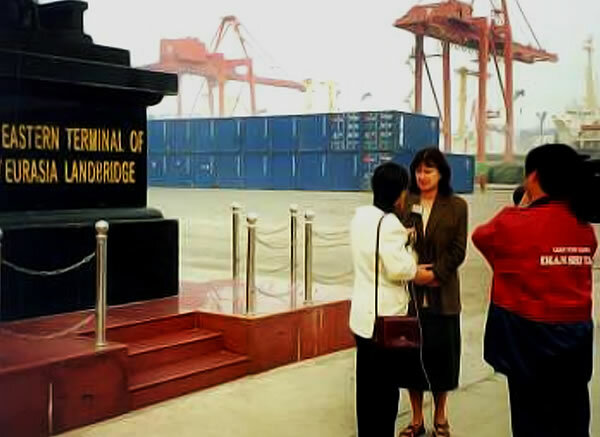 Helga Zepp-LaRouche pictured at the 'Eastern Terminal of the Eurasian Landbridge' in China. Helga Zepp-LaRouche returns to China in the end of October to participate in a second conference on the Eurasian Landbridge, called "Asia-Europe Economic and Trade Relations in the 21st Century and the Second Eurasian Bridge," where she delivers a speech at the keynote session in Beijing titled "Principles of Foreign Policy in the Coming Era of the New Eurasian Land-Bridge" [PDF]. She begins her speech saying: "While the present meltdown of the global financial system obviously represents enormous dangers for the existence of entire nations and their populations, the profound discrediting of the institutions associated with that system, represents, at the same time, a unique and unprecedented chance, to replace the unjust principles of the old political and economic order with new, just ones, which will allow the survival and well-being of all nations on this planet." 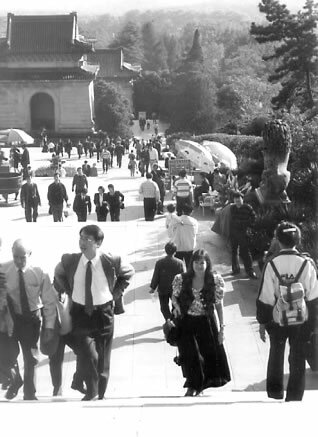 Helga Zepp-LaRouche visiting the tomb of Sun Yat-sen in Nanjing, China in 1999. Helga LaRouche states that it will be through the mutual development derived from the construction of the Eurasian Landbridge project that a stable relationship between respectively sovereign nations, peacefully cooperating for their common benefit can be achieved, such that each nation's sovereign interest will be in accord with the interests of the other: "If the new, just world economic order is supposed to function, the ancient philosophical paradox of the One and the Many has to be addressed. The unifying principle has to be the development of mankind as a whole, and there has to be an intelligible scientific principle for how that development can be measured. At the same time, the principle of national sovereignty must be absolutely guaranteed. Universal history proves that there must absolutely not be any contradiction between these two ideas." "These actions include, the power of the sovereign government to put bankrupt institutions through government-directed bankruptcy reorganization, and to generate large masses of newly created credit, deployed through national banking methods of a Hamiltonian type, to suddenly increase levels of useful employment, rather than allow a collapse of employment and of essential services. This kind of emergency action must occur not only within nations, but in rapidly expanding hard-commodity trade among nations, with special emphasis upon lines of trade within the hemisphere... Without international cooperation among sovereign governments, along such lines the otherwise manageable economic crisis immediately be fore us will not be overcome." LaRouche delivers keynote speech in Khartoum on the New Bretton Woods and the New International Economic Order. "First, we must restore the characteristics of the old Bretton Woods system of the immediate post-war decades. 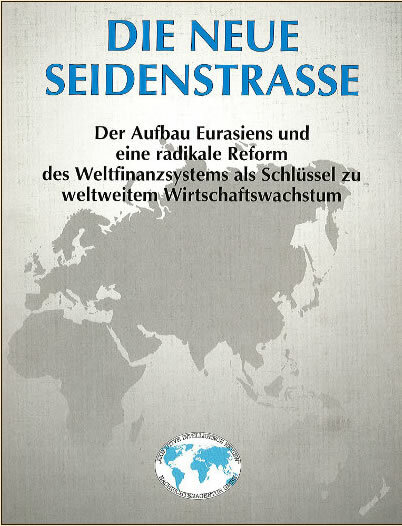 That means, a system of fixed-exchange rates, capital controls, currency controls, and financial controls, and global growth fostered by the same methods employed through institutions such as Germany's Kreditanstalt fur Wiederaufbau, to promote large-scale development of basic economic infrastructure, and to use the market potential generated by that infrastructural development, as the base for creating a still-larger rate of growth in development of agriculture and industry. "Second, we must do as President Roosevelt had intended: all sovereign nations must be, on principle, full partners in the new international monetary system. This is the fundamental difference between the old Bretton Woods system, and what must happen now. We cannot have a system which is going to work, which does not treat the majority of the human race as full partners in the system. Otherwise, it won't work. "Third, we must rely chiefly on credit created by the authority of perfectly sovereign nation-state governments, to generate the medium- to long-term, domestic and international trade agreements on which the economic recovery and expansion will be centered." 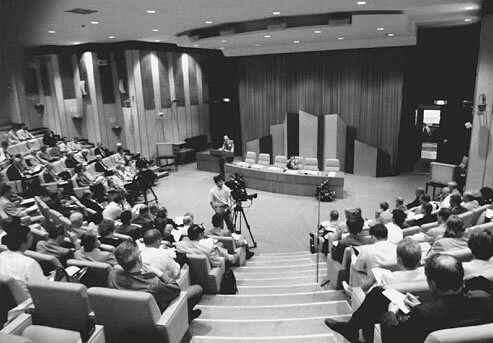 Lyndon LaRouche addresses a hearing of the Economic Policy Committee of the Russian State Duma on June 29, 2001. On June 29, 2001, Lyndon LaRouche speaks before an official hearing of the lower house of the Russian Parliament, the State Duma, during hearings sponsored by Sergei Glazyev, the chairman of the Duma Committee on Economic Policy. The hearing, titled "On Measures to Ensure the Development of the Russian Economy Under Conditions of a Destabilization of the World Financial System," was attended by 150 parliamentarians and government advisors and broadcast live into all Duma offices and the Kremlin. Sergei Glazyev introduces LaRouche, saying: "I want to open our parliamentary hearings and to give the floor to our guest, the well- known philosopher, historian, and economist Mr. Lyndon LaRouche." 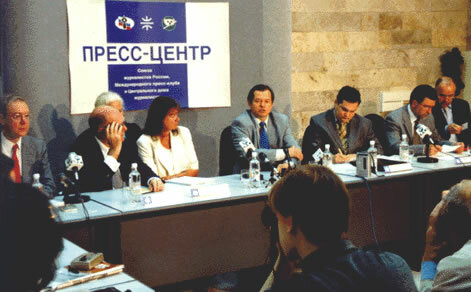 Lyndon and Helga LaRouche appear with Sergei Glazyev at a pre-hearing press conference in Moscow. 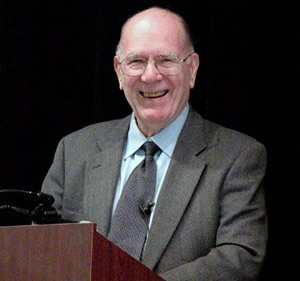 In his testimony, LaRouche states that "nothing can save the present world financial and monetary system in its present form" and lists four necessary measures to reorganize the global economic system including the cancellation of illegitimate debts and the reorganization of the rest, stating: "The reorganization of the world monetary and financial systems, must be based upon the use of large-scale, long-term cooperation in infrastructural development within, and among nations, and heavy emphasis upon adopted targets of scientific and technological progress. The pivot for world economic growth, shall be a new system of transcontinental cooperation among the sovereign nation-states of continental Eurasia." Therefore, to speak of any economic policy which does not include an early and sweeping reform of the IMF system is worse than a waste of time. 2. 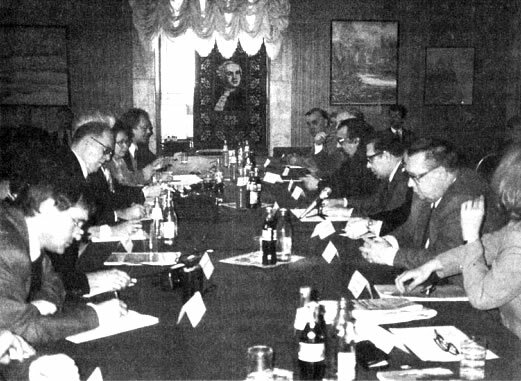 The revision of the international monetary and financial systems must incorporate the best features of the 1945-1958 cooperation between the U.S.A., Western Europe, and Japan. This must be a vigorously protectionist form of monetary and financial system, solidly based on true partnership among perfectly sovereign nation-states. 3. This reorganization of the world monetary and financial systems, must be based upon the use of large-scale, long-term cooperation in infrastructural development within, and among nations, and heavy emphasis upon adopted targets of scientific and technological progress. The pivot for world economic growth, shall be a new system of transcontinental cooperation among the sovereign nation-states of continental Eurasia. 4. Those regions, within and among nations, which can generate "fountains" of scientific and technological output to regions which are deficient in their available supply of such technology, must be envisaged as suppliers of not money technology, must be envisaged as suppliers of not money costs, for that purpose. Continental Eurasia should be the center of such global economic recovery and growth, but all the world will benefit through participation as partners in such an effort. Under the conditions created by a general bankruptcy now pervading the world's principal banking systems, the required credit must be generated by political actions of sovereign credit must be generated by political actions of sovereign governments, using newly created national-banking institutions as the pivotal agencies through which relevant agreements are coordinated. Inevitably, there will be many who scream in protest against the return to the protectionist practices associated with the names of economists such as Leibniz, Alexander Hamilton, Friedrich List, and Henry C. Carey. No amount of such screaming will change the basic fact, that the system of "free trade" and "globalization," has proven itself a catastrophic failure, relative to the protectionist policies of the 1945-1958 interval. The U.S.A., the putatively leading economy of the world, is presently bankrupt, and under any continuation of the Bush Administration's present policies, it is hopelessly bankrupt. In the meantime, the movement toward cooperation within continental Eurasia, already represents the cornerstone for the kind of cooperation needed to rescue at least much of the world from the presently onrushing global financial monetary, and trade crisis. Since the 1995 Halifax summit, but above all, since the Russian GKO crisis and the near-collapse of the world's biggest hedge fund, LTCM, the governments of the G7 have had recourse to only one measure: pumping unbelievable amounts of liquidity. The speculative bubble in the "New Econ omy," which was the direct result of this liquidity pumping, has burst, and inflation, which had earlier represented asset- price inflation, is now spreading as commodity-price inflation, with a tendency towards hyperinflation. At the same time, due to internal economic breakdown, the United States is losing its role as the importer of last resort, which has hit Asian exports particularly hard: The tendency towards depression is increasing worldwide: banking crises, mass layoffs, depression. What is threatened, is a breakdown of the global financial system, of a sort not witnessed since the Fourteenth Century. LaRouche proposed, instead, to go back to the principles of physical economy, in the tradition of Leibniz, List, Mendeleyev, and Witte. He presented the grand vision of a program for the "Paris-Berlin-Vienna Productive Triangle," as the locomotive for infrastructural and economic integration of Eastern and Western Europe, and for the development of the East. This concept called for the integration of the no-longer-divided industrial centers lying within the Triangle - the size of Japan - and the most developed industrial capacities in the world represented there, through modern infrastructure, like the Transrapid [magnetic levitation railway]. Investments in frontier technologies were to enhance the productivity of labor power and productive plant facilities, as well as exports, especially in technology and capital-goods sectors. From this "Productive Triangle," so-called development corridors were to radiate out, from Berlin to Warsaw and St. Petersburg, via Prague and Kiev to Moscow, and through the Balkans to Istanbul. Integrated infrastructure projects, with high-speed railways, highways, and waterways, and computerized railway stations, were to constitute the transportation arteries of these 100 kilometer-wide corridors, along which the most modern technologies and industries could be brought into the East. But the great opportunity, to place East-West relations, for the first time in the Twentieth Century, on a completely new basis, of peace through development, was missed. Margaret Thatcher, Francois Mitterrand and George Bush, chose the geopolitical option of excluding Russia as a potential competitor, from the world market, and reducing it to a raw-materials exporter. Bush proclaimed the "New World Order," which, like globalization, turned out to be the expression of Anglo-American unilateralism. Lyndon LaRouche and Helga Zepp LaRouche were officially received by India's President K.R. Narayanan (shown on left). Almost two decades after their previous trip to India to meet with Prime Minister Indira Gandhi in 1983, Lyndon and Helga LaRouche return to India to participate in an EIR seminar at the Jawaharal Nehru University School for International Studies, and to meet with top-level officials of the Indian government including two former Prime Ministers, Chandra Shekhar and I.K. Gujral. They also meet with India's President K.R. Narayanan as well as leading advisors of the serving Prime Minister, Atal Benhari Vajpayee. Lyndon LaRouche delivers keynote address at the Nehru University School for International Studies in New Delhi. Lyndon LaRouche speaks to attendees of EIR policy conference in New Delhi, India. And, that is exactly what we proposed in terms of the Eurasian Land-Bridge. If we can agree, and understand that the nations of East and South Asia require an early, and rapid infusion of technology, to develop these economies so that they can survive; and if this can be done through credit arrangements, extended by governments at interest rates of 1 to 2% simple interest, on long term; and if we take the great infrastructure projects as the driver force; and if we unite the need of Western Europe for markets for this type of technology, and the role of Russia, as the transmission belt between East and South Asia, and Western Europe; and if we think of this as the center of the world, and bring nations in Africa, in the Americas, into the same arrangement, then we have the basis for creating a new monetary system, under which this world can come out of this mess." 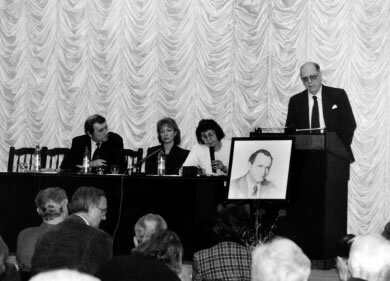 Lyndon LaRouche speaks at a symposium in Moscow honoring the late Russian scientist Pobisk Kuznetsov. For the second time in one year, LaRouche travels to Moscow for a four-day visit December 10-14 to participate in a scientific conference honoring the memory of Pobisk Kuznetsov who died the previous year. In addition, LaRouche also addresses a seminar hosted by Academician Lvov at the Central Mathematical Economics Institute (CEMI) and met with the Mayor of Moscow, Yuri Luzhkov. The Kuznetsov memorial symposium is titled "Space & Time in the Evolution of the Global System Nature-Society-Man" at which LaRouche speaks on the subject of "Russia's Role in Solving the Global Crisis" [PDF] in which he states: "If the world is to come out of this great financial, and monetary, and economic crisis successfully, Russia, as a Eurasian nation, must play a very crucial, central role... I have proposed, that we must develop development corridors, superseding the Trans-Siberian Railroad, across Eurasia... This would require, and would mean, the greatest transformation in the biosphere, in the history of humanity." Lyndon LaRouche appears before the Sao Paulo City Council to receive an honorary citizenship during a trip to Brazil in June 2002. "Governments must act to put the system into bankruptcy reorganization... What does this mean? First, we require a global, monetary financial reform. The best model we have is the 1945-1964 system, not as a perfect model, but as a political model. Under those, we must have, therefore, financial reorganization in various countries. We require an emergency monetary conference among leading countries to immediately negotiate a general reform and bankruptcy reorganization. We must also, then, take certain steps in each country and in treaty agreements to get the world economy moving upward... We must generate a tremendous amount of capital investment. How do we do that? We must create a credit system." LaRouche reasserts his Operation Juárez program for the western hemisphere, proposing the Americas integrate with Eurasia to form a new economic order. "We must also develop crucial fountains of technology from within various regions of the hemisphere. All of this must function within the framework of an economic protectionist form of fixed-rate monetary order among the currencies of the Americas, similar to the successful initial phase of the original, post-war Bretton Woods monetary-financial system. The development of such an arrangement and perspective within the Americas will directly complement and mesh with the similar system of continental-wide cooperation now emerging within the Eurasian continent. These two continental systems, will be the foundation for a global system." In January 2003, Lyndon and Helga LaRouche travel to India to participate in an extensive series of public and private events in several different cities including Calcutta, New Delhi, and Jaipur, on the subject of creating a Eurasian alliance to reorganize the bankrupt world financial system. The seminars keynoted by LaRouche included one hosted by the Institute of Economic Growth at Delhi University which serves as a leading think-tank for the government of India, and a conference hosted by the Political Science Department of Jaipur University. LaRouche emphasized in his speech to the Institute for Economic Growth, titled "The Indispensible Role of the State in Reorganizing a Bankrupt System" [PDF] that the "Strategic Triangle" of Russia, China, and India must be the primary engine for economic growth in the world, stating, "we must use the experience of the first phase of Bretton Woods as a model for reorganizing the international monetary and financial system, now." In his speech in Jaipur, titled "Globalization is a Prescription for Disaster" [PDF], LaRouche again highlighted the Strategic Triangle of Russia, China, and India "as a keystone for bringing together the nations of Asia in an alliance of mutual security and economic progress" and defined the means by which credit can be created to develop Eurasia: "We need to go back very quickly to a fixed-exchange rate system... We need a system under which nations can cooperate, as I indicated in the case of Asia: 25- to 50-year treaty agreements of cooperation. That means that each nation wants a strong national economy, because the basis of credit will not be central banking credit, will not be private credit... On the precedent of Alexander Hamilton, the state creates the credit and provides that credit for necessary projects in national infrastructure. The second way is through treaty agreements among The second way is through treaty agreements among states. That is, two nations who agree to a project, can guarantee each other a relationship over, say, a 25-year period. That will create credit, without issuing money... Put the bankrupt system into bankruptcy, and create credit for socially significant, economically sound, long-term projects, manage them well on the objectives determined, agreements among nations made, and we can recover." LaRouches Return to India: Renew The Fight for New Economic Order! 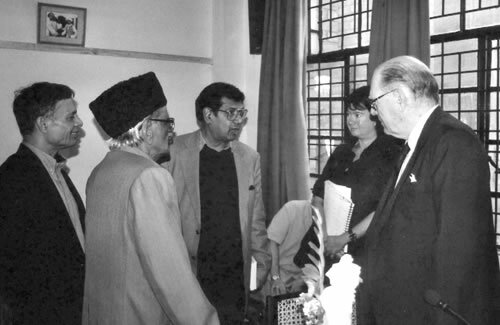 In May 2003, Lyndon and Helga LaRouche return to India for the second time that year to participate in a major international conference co-hosted by the Schiller Institute and the Center for Social Justice of India. The conference is opened with a speech by Indian Member of Parliament Shri K. Natwar Singh, who was the Secretary General of the Non-Aligned Movement under the government of Prime Minister Indira Gandhi when India hosted the Non-Aligned Movement Summit in New Delhi in 1983. In his speech, Singh emphasizes the historic role of the Non-Aligned Movement as leading the fight for the New International Economic Order. 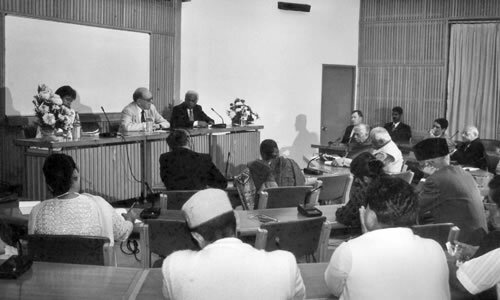 LaRouche then echoes that theme and declares: "We must have what we fought for at Colombo, Sri Lanka in August of 1976. We must revive the spirit of Bandung, as a part of an international movement. 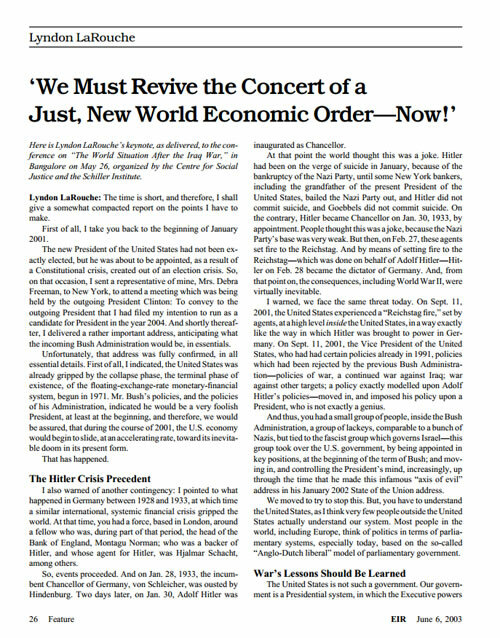 We must revive the concert of a just, new world economic order-now! LaRouche at a conference in Bangalore, India calls for the renewal of the fight for the new international economic order. "How can this be brought into being? We need large-scale projects, infrastructure projects. We need long-term agreements among nations on trade. We need fixed parities in currencies. We need interest rates on long-term loans which are not excessive: 1-2% simple interest rate. We need 25- to 50-year agreements and treaty agreements, among nations on trade and development. We need a monetary system, with many of the best features of the Bretton Woods system, of the immediate postwar period. But, this time, the United States can not run it, as the United States did back then... . We must have a concert of nations which does this. We must have a concert of nations take over the international financial institutions, and reform them. We must use the power of government, to put bankrupt systems into bankruptcy reorganization. We must use the power of government and treaty agreements, to create large-scale credit and credit systems, to enable these potentials to be realized." 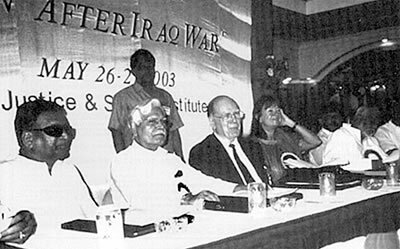 LaRouche appears at a conference in Bangalore, India along with former Secretary General of the Non-Aligned Movement, Indian Member of Parliament Natwar Singh. 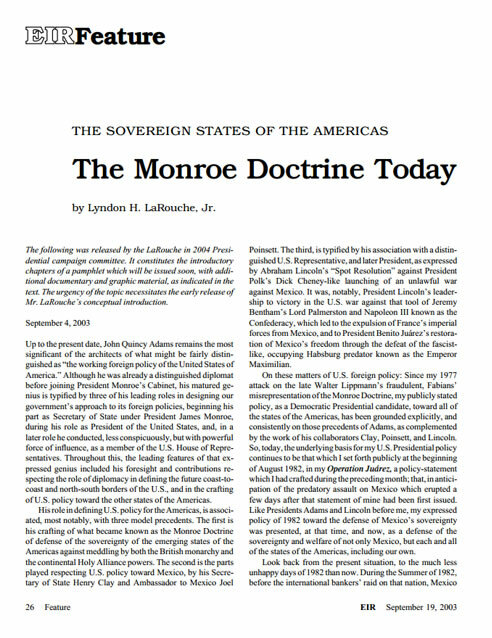 LaRouche also authors a written policy document for the conference, titled "A Precis: The Peaceful Concept of Technology Transfer" [PDF] in which he details the necessary scientific principles to be applied in "establishing a more just, peaceful, and profitable new world economic order within a global community of perfectly sovereign nation-states." 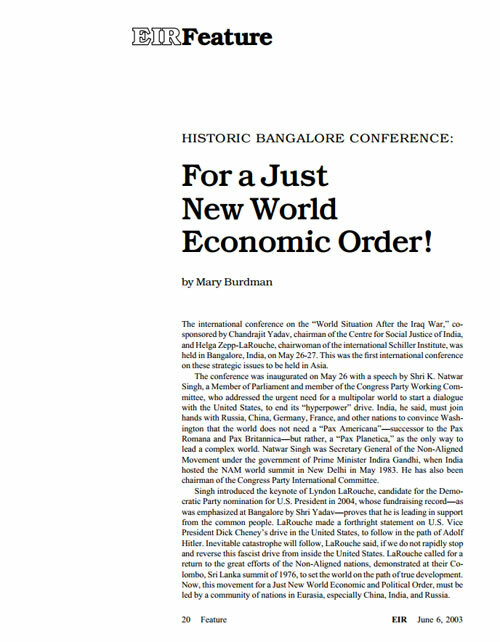 The conference participants endorse The Bangalore Declaration: 'Toward a New World Political-Economic Order' [PDF] which states: "Establishing a just and equitable economic order in the world is an urgent necessity if the vast majority of people in the world are to enjoy the benefits of human and scientific progress... Developments leading to war, especially the position adopted by some of the leading powers, demonstrate that the international order is becoming less aligned. This opens new opportunities to strengthen the process and build a more cooperative International Order. What we need is a new community of nation-states, non-aligned in military terms, but aligned against all forms of political, social, and economic injustice, and a global movement to pursue a new, just political-economical order... The conference calls upon the peace-loving people, especially young men and women, to launch a worldwide movement to achieve the above goal." 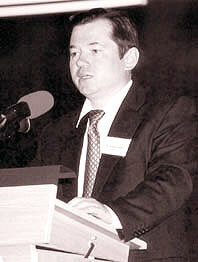 Sergei Glazyev calls for a new world financial architecture during a press conference in Moscow in 2004. Member of the Russian Duma Sergei Glazyev, who had invited Lyndon LaRouche to Russia in 2001 to testify to the Russian Parliament, issues a call for a "new world financial architecture" during a press conference in Moscow announcing his campaign for President of Russia [PDF]. Glazyev states: "The key priority today in world politics, where Russia could take the lead, is the formation of a new world financial architecture... Russia could take active steps to transform the ruble into an international reserve currency, and propose to all countries to shift to an equality-based, mutually beneficial system of financial and monetary relations, rejecting the use of the national currency of any one country as a world currency. We should get away from the excessive dependence of the world financial system on the currency issues of any one country, and shift to a system of equality-based financial and monetary relations. In practical terms, it is possible to reach a consensus among a large group of countries and begin to move to a new world financial and monetary system that would be more stable, more reliable and more fair." Lyndon LaRouche publishes book titled 'Economics of the Noösphere' developing on the ideas of Vladimir Vernadsky. In April 2004, LaRouche travels again to Moscow to keynote a conference sponsored by the Vernadsky States Geological Museum of the Russian Academy of Sciences and cosponsored by the Schiller Institute. 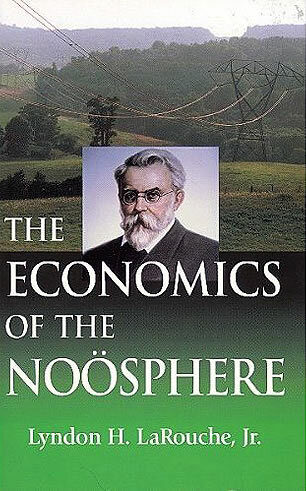 LaRouche's speech, "Entering the Economy of the Noösphere" [PDF, echoes the themes which he elaborates in his newest published book, titled "The Economics of the Noösphere" featuring the ideas of Russian scientist Vladimir I. Vernadsky. LaRouche declares that mankind is entering "a new era" which must impel revolutionary changes in the existing economic order: "Hopefully, the increasing severity of the present world economic and related crises, will compel us to institute those urgently needed changes in the present world order... The growing needs of humanity could not be met without the kind of scientific revolution which we should associate with what the great V.I. Vernadsky defined as the Noösphere... We are entering a new era of mankind, an era which must grasp more fully, more practically, the implications of V.I. Vernadsky's development of the notion of the Noösphere."